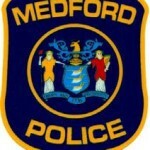 At last week’s Medford Town Council meeting, the Medford Police Department swore in two new officers and recognized the outstanding efforts of a number of existing officers. Before Police Chief Richard Meder got started with a moment of silence to honor the 116 law enforcement officers who lost their lives in the line of duty this year, he gave a special thank you to the support staff who play a vital role in keeping Medford safe. “I’d be remiss if I did not thank our outstanding civilian support staff for all that they do. They truly are the unsung heroes of the police department, and I can’t thank them enough,” Meder said. Officers Christopher “CJ” Walsh and Andrew Morgan were accompanied by their families as they read the oath with Mayor Charles Watson to solidify their new role as police officers. Walsh grew up in Medford and graduated from both Shawnee High School and Rowan College at Burlington County. From 2003–2006, he volunteered as an EMT with Medford Township Emergency Medical Services. He was hired as a full-time communications officer with the Medford Township Police Department in 2004. He then went on to attend the Gloucester County Police Academy, where he graduated at the top of his class. In July 2006, Walsh was hired as a full-time police officer with the MPD but was laid off in 2012 due to the economy. He was quickly hired by the Burlington City Police Department, where he served for the next three years. Walsh was appointed back to the MPD in October. “CJ, on behalf of the entire Medford Police Department, welcome home,” Meder said. Morgan has a bit of ocean water in his blood, as he was born and raised in Ocean City, where both of his parents worked for the Ocean City Police Department. He attended high school in Ocean City and later attended Rowan University, where he worked toward achieving a degree in criminal justice. He began his career in law enforcement as a special law enforcement officer in Ocean City. Morgan later attended the Cape May County Police Academy Class Two Program. He was appointed as a member of the MPD in October. “You are about to embark on one of the noblest professions — one that is rewarding but never in our history has it been so difficult. The challenges that you will face in your career will be many. Rise to not only meet those challenges, but to overcome them,” Meder said. Meder referenced Abraham Lincoln when discussing the power these men would now possess as police officers. “All men can withstand adversity, but if you want to test a man’s character, give him power. The power bestowed upon you as a police officer is tremendous. Recognize it and don’t abuse it. Always respect it. Have strength of character, have integrity, be righteous and never forget the oath you’re about to swear,” Meder said. The MPD also held its annual award ceremony during the town council meeting, a tradition that has been going on for 30 years to recognize police officers’ outstanding service throughout the year. Numerous awards were distributed for courageous acts by officers during threatening scenarios.